Elizabeth contacted me and asked if I'd like to try out Alexia bread and then host a contest if I liked the all natural bread. I was game, and she sent out sweet potato bread which I'd never had. I fell in love with this bread which is yummy enough to be dessert. 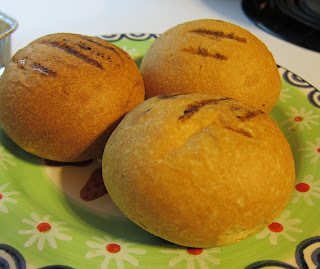 Although I grilled my Alexia rolls, they were not specifically designed for grilling. So, if you don't grill, don't click out on me. You can do these delicious rolls in your oven. That's what you'll see on the directions. Just a few minutes and nice hot bread. Got to love that. Since the rolls were a thumbs up here, I'm rolling with the contest. I did get a bag of rolls to check out, but that's all. The contest is just a bonus for readers. I keep my contests simple, and I don't track your information or spam you. Just leave a comment and some way to get in contact if you win. I just get in touch to get your snail mail, so Alexia can send you the prize. Easy as that. Some people like extra entries on contests giveaways, so if you FaceBook or Twitter this post so others can have a chance at some great rolls, then do that and then post that you did either or both. Do a new post for each entry please, so I make sure to get them all. I'm still low tech and put your names on slips of paper and have a family member pull a name. The contest ends 3-9-2013 with the winner contacted 3-10 (my last day of break), so be sure to get entered quick! With your coupon, you get to pick your Alexia natural food product. 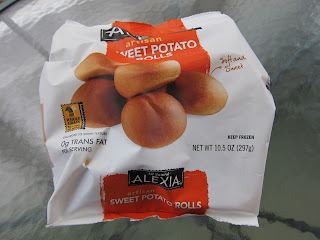 I loved the sweet potato rolls. They are sweet, so I'd call them right at dessert. Yum! But, you can pick what you want, since you get a free coupon and decide for yourself. Follow Up: Jan is the winner of the contest. Congratulations Jan and enjoy your goodies from Alexia! OMG....sweet potato rolls. I have to try those! If you put your seal of approval on it Cyndi then I'm game ....put me down for this !! Cyndi, the Alexia French rolls are vegan! How great is that? I'd never heard of the company before, but those photos you posted look delicious! Would love to try the sweet potato rolls. They look yummy! Sounds interesting. Would love to try. and you believe I can't grill? Maybe not, but I know how to BBQ, and rolls are great with BBQ.....Want me to prove it??? Also shared link on FB - Tara. Better odds than Powerball . . .count me in.